I love surfing because I love the ocean. I like watching the infinite motion of nature, feeling the cosmic love relationships between the Earth and the Moon. This story is full of metaphors and it is about that magic connection with the ocean that I gained again with a help of surfing. There will be no attractive photos of girls in bikinis or cool photos of me riding the waves, but you will find something more than that. I will openly share with you something that we are at times afraid to talk about with others. My recent surf camp in Bali inspired me to put it all together. It wasn’t just a regular fun surf trip in the middle of the Indian ocean. It turned out to be a personal theory and practice kit on letting go of past experiences, mistakes, expectations and learning how to start fresh and trust one-self again. Water is my element. I am inspired by the water element that surrounds us and lives within us. Have you never been surprised by a weird and beautiful coincidence that a human body on average consists of 70% of water while the world ocean covers 70% of the Earth? I was born inland in Russia so we were especially far away from the ocean. Thus, we explored lakes and rivers in summer, caught raindrops by mouth and ate snow & icicles during winter. Regular trips to the seaside that my parents organised for all of us were great. That’s how we were introduced to “All Inclusive” trend in Turkey and dipped ourselves in the Mediterranean waters. Then years later we got introduced to the Atlantic Ocean scenery. My dad also helped me to explore the water element while doing various water-related activities with me. We built sand castle on the beaches of Cote d’-Azur, jumped off 9 meters cliff in Majorca, went out in the ocean with a company of best friends – dolphins, explored the deep Red Sea in Egypt and tried to bodysurf while catching waves in California. I must say and thank my family who encouraged my growing interest and passion to water element through various and cool activities. During my teenage years I became a part of a skateboarder’s crew and was exposed to an extreme sports subculture. There was no such thing as surfing in Russia at that time. But all my friends and I were intrigued by the unknown and foreign nature of surfing and this is how eventually The Endless Summer movie replaced Pretty Woman, Save the Last Dance, Never Been Kissed videotapes on my shelf. At the age of 15 I set myself a new dream goal – I wanted to live by the ocean, closer to the waves, so I could learn more about the art of surfing. My generous and gorgeous sister organised a dream trip for both of us to celebrate my 20th birthday in Bali. That’s when I tried surfing for the first time and “kind of learnt how to stand” on a surfboard. I took a few classes at the Rip Curl Surf School in Kuta. I was given the longest softtop possible (I think it was about 9 foot or so), helmet, lycra, boardshorts, and a few instructions on the beach. We painted our faces with sunscreen and went into the ocean. I remember how local instructors were escorting us to a line-up by dragging students by pulling a leash, pushing through the whitewater of waves and then pushing onto the waves themselves yelling something like: “Get up, jump on board now…” The provided us with a full-on Surfing GPS-service. It was easy, fun and relaxing. And that’s what I was thinking surfing was about. I lost my “surf virginity” with a sense of absolute comfort and security and let my “partner” do all the hard/easy work while leaving me with a sense of wave riding accomplishment and loving the ocean even more. It was a truly positive experience. 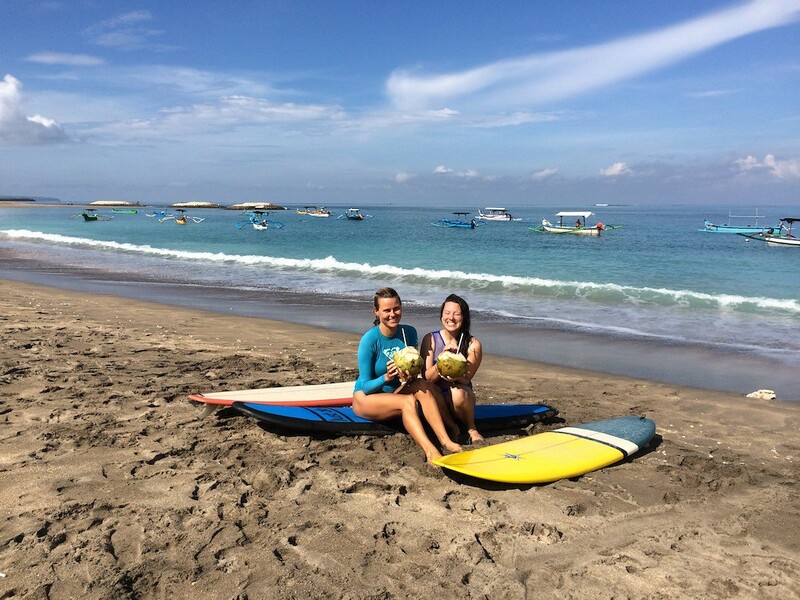 During my further on-going trips to Bali I received a different taste of surfing that not only came with rough ocean conditions and stressful wipeouts, but mostly happened because as a surf student I was treated irresponsibly and my level of surfing, my fears and doubts were not taken into account or taken seriously. My surfing agony started when a surf-instructor picked up perfect surf conditions for himself not me and took us to ride unsafe waves. They were big (for me), fast and furious. And I wasn’t ready to surf them, I DIDN’T want to surf them which I never told him about. However the waves seemed fun for my surf-instructor who was catching them one after another. He didn’t seem to care too much about my progress and surfing experience. And then a massive clash happened. A big set of waves came along and I found myself alone in the water, fighting against the ocean, whitewater and more importantly fighting against myself, stubbornly trying to get through that “washing machine” no matter what, to prove to the instructor that I could catch and ride a wave which I did. And that wave was full of mixed feelings – hate, horror and a slither of joy… When I hit the shore my surf-instructor gave me a cunning look and a few claps saying: “I think you can be a surfer now, as you can be in the water on your own…You passed the test by the ocean. go and surf now.” I am sure for some people this may sound like inspiring and uplifting feedback. But for me, at that point in time, it wasn’t at all. They sound like a requiem for a dream. I didn’t even want to think about surfing again. I was full of despair, fear and anger. Clinging to that intention I faced new waves over and over again. There were warm waves in Bali, Lombok, Sri Lanka and cold waves in Portugal that I explored as a part of amazing surf-camp that brought me together with so many cool people there, including the owner of it – Sebastian Wolf. But everywhere I went I felt strongly dissatisfied with myself in terms of surfing. Not matter how many waves I caught I never felt a gram of joy or a pride within myself. New surf spots, channels felt harder to get through, waves felt bigger. I felt blind and deaf to everything that surrounded me. All I could relate to was that familiar breath of my old friend; fear. Once it got noticed, anxiety paralysed my body, making my movement robotic and pushing me away from the water… my favourite element. In 2011 I moved to Auckland, New Zealand, approaching my 15-year old dream even closer than ever. I found myself surrounded by two magic coastlines – rough, unpredictable, stormy along with raw beaches on the West Coast; and magic and peaceful white sand beaches on the East Coast. The variety was impressive but so scary to me. I got lost in that current of opportunities. A few surf trips ended up being in the whitewater without feeling proud of myself. Watching surf dudes riding the tubes and being able to surf 3-4m waves and realising that I can’t do it (and if I can’t do it why am I doing it in general?) this really pushed me away from all that surf jam. I just felt out of my league and didn’t know where I could belong. This sort of self-talk made me question why I ever started to surf…and why should I want to surf…? Suddenly, I remembered myself sitting in front of the TV watching The Endless Summer when I was 15. I was hooked by the very idea of experiencing an interaction with the ocean. It was like a divine balance. I wanted to experience how it would feel to ride a wave and let a wave ride you. I didn’t think of proving anything to anybody that I could do it, I didn’t want to become a pro surfer or move to Hawaii. I simply wanted to try surfing and have zero expectations of myself. But somehow this self-attitude has changed within me over the years. I started to question if I actually genuinely loved surfing. Do I surf for my own sense of joy or do I surf to meet expectations of others like that arrogant surf-instructor that approved my examination level and allowed me to surf waves that were well out of my depth at that time. Those questions kept on playing up on my mind. But I wasn’t ready to answer them or see the truth. I wasn’t ready to see that my greatest enemy was myself, that self who always wanted to be the best, the strongest who couldn’t allow herself to fail and not be perfect. So eventually that “best ideal self” wiped me out from the world of surfing and made me so certain that surfing wasn’t my thing. So I stopped. 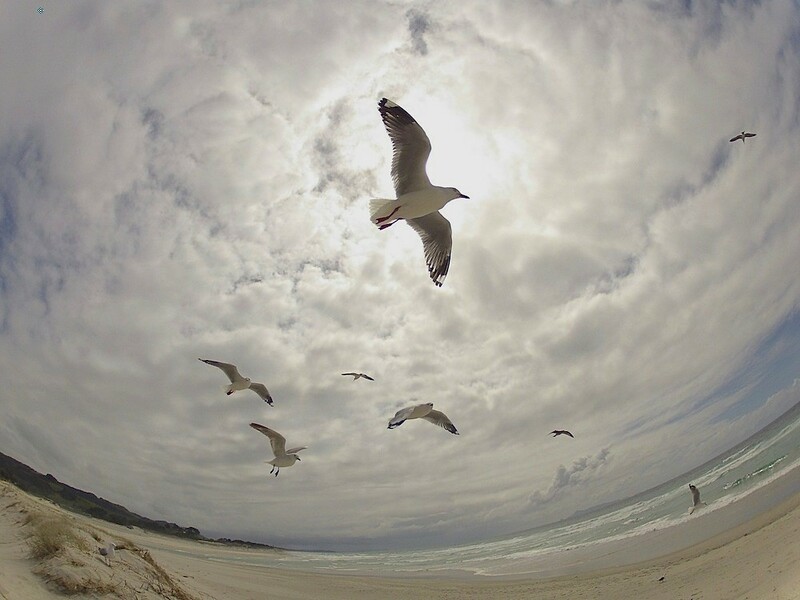 I stopped although I was so close to my dream… I was so close to the ocean as never before. I was close to the most beautiful coastlines in New Zealand. I was surrounded by a variety of uncrowded surf spots and I made the decision to stop surfing. 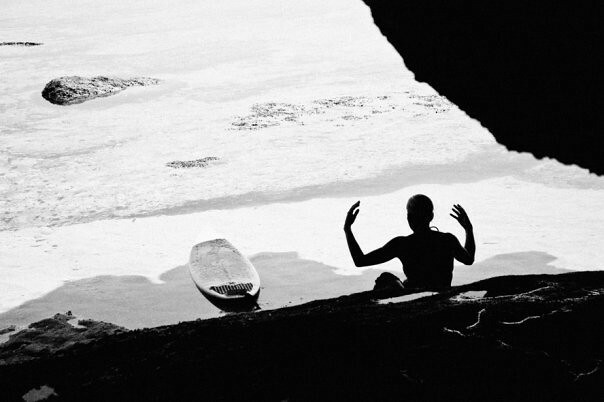 Finishing surfing didn’t affect my desire to find comfort and harmony within my spirit. I wanted to live freely and driven by love, not fear. Through the lens of life epiphanies and self- development I was recently hit by the biggest, scariest, the most powerful and painful wave in my life – I faced my true self and saw my raw truth which didn’t have a pretty face. But this time I decided not to ignore that side of me. I did the opposite – I managed to closely look through all scars, bleeding wounds, pink flaws and blue weaknesses, deep pain and suppressed anger. I started to embrace and love my imperfections. I found courage to find time to sit still and let myself connect the dots of all parts of me. And it was my bittersweet revolution. Going through an intense emotional detox I felt like spending more and more time with my new self and getting away from my routine in Auckland. A romantic tropical getaway originally planned for two of us turned into a solo-trip to Bali. I still thank you, dear Dan, for letting me be there on my own so I could experience it with all my activated senses and shades of blue, so I could start a new romance with myself and find harmony and peace within. Interestingly enough my surf girl Keshka that I mentioned earlier, now lives and runs amazing surf-camps in Bali, happened to organise her last surf-camp exactly on the same dates as was my trip. What a lovely and well-timed coincidence?!? Now I could not only have some “me time” somewhere I’d rather be, being surrounded by the nature, Balinese culture, coconuts and papayas, sharing stories and silence with my surf friend, but also I could finally turn a page in my surfing life, start fresh and learn from early beginners days. So that’s how I allowed myself to start fresh and learn the basics of surfing all over again, just because it felt right and that’s what I wanted to do. Perfect timing. Perfect teacher. Perfect Indo waves. And it’s that rare case when the word “perfect” doesn’t do any harm. Besides Vika and I both agreed that we shouldn’t expect anything from each other. This helped me to relax and made most of our surf lessons & conversations, cool surf trips followed by Vika’s encouragement and advice which she would give me now and then. I was okay to hear that my posture on a surfboard that I was taught almost 10 years ago wasn’t right. It might hurt my ego a bit, but I let it go easily. I was keen to practice a new posture and do 30 or so jumps on the sand before getting into the water. I was okay with a soft board and practicing my jumps in the whitewater and having fun whilst doing it. I could do it for sometime. It felt good, easy and safe. But Vika didn’t want to waste my time, as she knew my potential and had faith in me she wanted me to feel connected to the world of surfing again. Feeling that support from a friend was deeply inspiring. And so it happened. We came to Balangan at the right time when the waves were nicely pumping, paddled through the channel and enjoyed the line-up view, best seats in the house – watching 2m waves curling in and surfers riding in a small tube. As conditions were getting rougher and rougher Vika said that it was better to catch a wave now to get back to the shore. She left me with no time for overthinking, hesitation or anything else. She could read the fear in my eyes. I could hear that fear breath too that was holding me back for so many years. It was my time to break free. So we did it. I lay down on the board, started to paddle on the wave and then Vika pushed me on my first, 9-months-surfing-free period wave and it was truly magical. It was fast, fun, long and gentle at the same time. I screamed, laughed and yelled all the way along the wave. I was in a divine balance. I felt the Universe was smiling in me. I was saluting to that feeling of breaking free. I was saluting to myself and my possibilities…I was saluting and cheering everyone around me. I felt like I won the biggest title in my life – I gained my FREEDOM back. Vika surrounded me with the magic spell at other surf spots where I felt supported, looked after and someone who cared about my progress, was able to put aside my worries & blocks. Her regular inspirational speech started like: “You need to catch that wave that makes you feel “Oh no…! Push against your comfort zone, Yana! Paddle hard and stand up. You don’t know what you are capable of.” It took me sometime to realise that it was true. And that I should trust myself more. It took some time to let go of past unpleasant memories that I had with other surf-instructors and people. It took sometime to truly deeply madly TRUST my friend, my guru, my surf girl, my teacher. But when it happened I felt that deep shift that brought a different interpretation of reality and self-perception. When from one wave to another no matter what the outcome was – whether I catch it, miss it or dig in it – I was feeling more and more joy spreading all around and in me. My level of confidence was pumping in parallel with a level of enjoyment from the surrounding scenery – fish and corals under your feet, birds up in the sky, coconut palms on the beach, early sun that gently touches your skin and an anticipation of a new wave-friend coming your way… And then when I got a momentum of true relaxation and joy I felt that I am not the only one who is riding the wave, it is riding and directing me…We are meant to be together. I listened to the wave, to its natural flow that allowed me to be a part of that dance…And it was beautiful. Thank you, my dear friend and amazing teacher Keshka for being a part of my rebirth! If that swell didn’t happen to me, if that storm didn’t rise from inside out I would not be able to feel alive again and restart my surfing affair and reconsider the rest of the gems in my life that I could have lost in my life. I would also say “NO” to all other things I simply LOVED doing and living through – singing, performing and writing. I was putting the brakes on all of these creative parts because none of these activities led me to an overwhelmingly positive outcome, financial success or prosperity. That high expectation on myself – “to be the best from the West” and please everyone with what I do, say and how I operate was my sort of a constructed craft – a self-made thought-provoked jail where I kept myself locked for a long time. The big swell came and set me free. Surfs up, ladies and gentlemen! Photos from Bali / Lembongan surf-trip 2016 you can find in Flickr albums here. "The best project that you can always work on is yourself." "Be more creative with your reality." "Think it, speak it, do it!" "Just to be here. Just enjoy the moment!"